The C168H/PCI multiport serial board is designed for people looking for an easy-to-use 8-port serial board. Plug the C168H/PCI board into the appropriate PCI slot, and all configuration tasks will be done automatically, eliminating the need to adjust I/O addresses and IRQ hardware switches and jumpers. To improve reliability, surge protection (25 KV) and optical isolation (500V) are available as options. The C168H/PCI board allows you to install additional RS-232 serial communication ports on your PC by providing 8 serial ports per board for connecting all types of serial devices, including terminals, modems, printers, data acquistion equipment, and more. And C168H/PCI's versatile OS driver support truly fulfills the needs of our customers' varied applications. 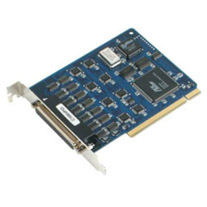 C168H/PCI offers a reliable and high performance solution for serial multiport communications.